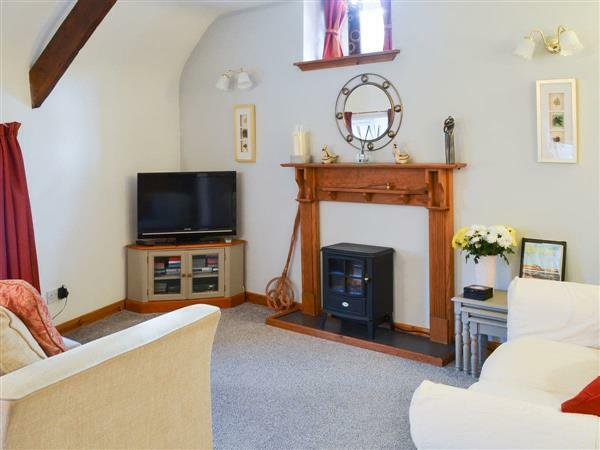 Well House Hayloft in Belford, Northumberland sleeps 3 people. Well House Hayloft in Belford is situated in the heart of Belford, only 6 miles inland from the highly sought after coastal village of Bamburgh. 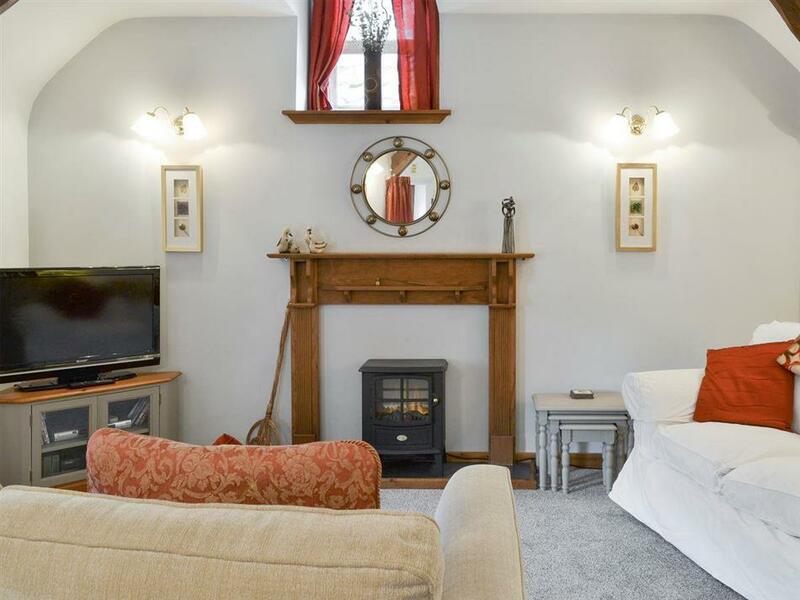 With independent access, the accommodation is all on first floor and offers an open plan living area which has been tastefully furnished with a lovely blend of charm and character mixed with a contemporary twist. External steps lead from the kitchen area down to a courtyard, which is shared during the day with customers of the tea room below and is for private use during the evenings. Belford is often described as ’The Gateway to the Secret Kingdom’ and offers many facilities including shops, a tea room (conveniently situated below Well House Hayloft), pubs and an impressive golf driving range. The picture-postcard, coastal village of Bamburgh, dominated by its majestic fortress and wide expanse of golden, sandy beach is only 6 miles away. The small and friendly market town of Wooler sits at the foot of the Cheviot Hills, a popular destination for those who enjoy cycling, hang-gliding, golf, horse riding and walking, with the challenging route of the St Cuthbert’s Way close by. Chatton Trout Fishery invites amateur anglers to fish, without needing a licence, on a picturesque, 4-acre lake. Belford is located only a mile from the A1, giving easy access to the elegant Georgian town of Berwick, which straddles the salmon-rich River Tweed to the north. The cobbled market town of Alnwick, protected by its dramatic castle and offering a wide array of amenities is close by. Alnwick Garden is a popular visitor attraction to see the Grande Cascade Waterfall, and dine in the restaurant within the largest tree house in Europe. Take a trip to the vibrant cities of Newcastle-upon-Tyne or Edinburgh, both are only an hour’s drive away, or enjoy the journey by train from Berwick or Alnmouth. Well House Hayloft provides an excellent base from which to explore the north Northumbrian countryside, along the Northumberland Heritage Coast, an Area of Outstanding Natural Beauty, and the Scottish Borders. The beach is 6 miles from Well House Hayloft in Belford. With the shop 200 yards, and the pub & restaurant being 100 yards from Well House Hayloft. First Floor: Well House Hayloft in Belford is all on the first floor. Electric central heating, electricity, bed linen, towels and Wi-Fi included. Patio with garden furniture (shared with customers of the tea room during the day). Private parking for 1 car. No smoking. Holidays at Well House Hayloft run from Saturday to Saturday. For a better idea of where Well House Hayloft is, you can see Well House Hayloft on the map below. Well House Hayloft is in Northumberland; should you be on the lookout for a special offer, you can find all the special offers in Northumberland. It's always worth checking to see what is on offer at the moment. Do you want to holiday near Well House Hayloft (UK3134), you can see other cottages within 25 miles of Well House Hayloft; have a look to find your perfect holiday location.